Train enthusiasts get ready, as the BFI have announced a new volume of rare and unseen films to thrill lovers of train travel, British heritage and vibrant documentary filmmaking as The Driving Force joins the BFI’s best-selling British Transport Films Collection series next month. he twelfth volume in this highly popular series of double-DVD sets presents a selection of previously unreleased films which explore and illustrate the improvements and developments in train services that were offered by British Transport between 1955 and 1982. 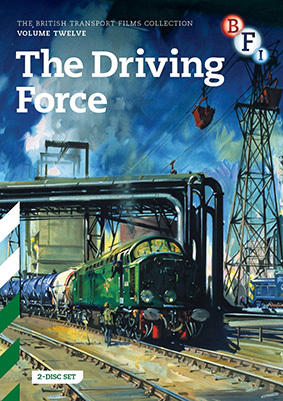 Amongst the highlights of this new volume are the titular film, The Driving Force (1969), which details the vast programme under which the changeover from steam to diesel and electric traction was achieved; and Partners in Prosperity (1982), which outlines plans for a truly modern integrated road and rail transport structure in Scotland. This digitally remastered collection, which is accompanied by a booklet containing an introductory essay and extensive film notes by BFI curators, is a must for the transport enthusiast and the documentary aficionado alike. The British Transport Film Collection, Vol. 12: The Driving Force comes to UK DVD on 24th February 2014 from the BFI at the RRP of £19.99.